Rory McIlroy gave himself a confidence boost heading into the Masters as a final-round 65 earned him a share of seventh place at the Houston Open. McIlroy's bogey-free round matched the low score of the week as he finished seven shots off the pace. "I wanted to shoot something in the 60s at least today to give me some positive vibes going into Augusta," said world number seven McIlroy. "I played really well, played really solid from tee-to-green again." 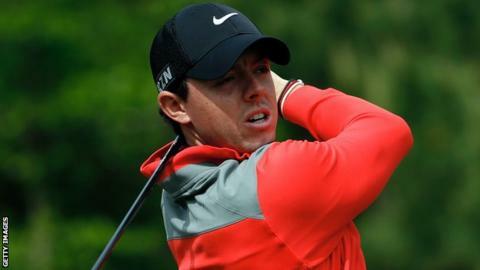 The 25-year-old was also delighted to have putted before after some struggles on the greens earlier in the tournament. "I holed the putts that I felt I should hole and just kept the ball in play all day. "Every time I hit it pretty close, within 10 feet, I holed the putt. It was great to see a few putts like that drop." Saturday's 74 had left McIlroy down in 37th place but he was in a far more positive frame of mind after his closing round in Houston. "I'm happy with how this week went, even though I didn't quite do what I wanted to do in terms of getting in contention. "But I sort of made up for it today. I couldn't be in a better mood getting on the plane and heading over [to Augusta] tonight." McIlroy's finished six shot behind winner Australian Matt Jones sensationally chipped in at the first tie hole in a play-off to beat Matt Kuchar after the American found water on the last hole in regulation play. Kuchar did well to get into the play-off as he got up and down to bogey the 72nd hole but the drama then continued as Jones chipped from around 30 yards at the same 18th to secure his first PGA Tour win. The Australian's win secures him a place in this week's Augusta field.